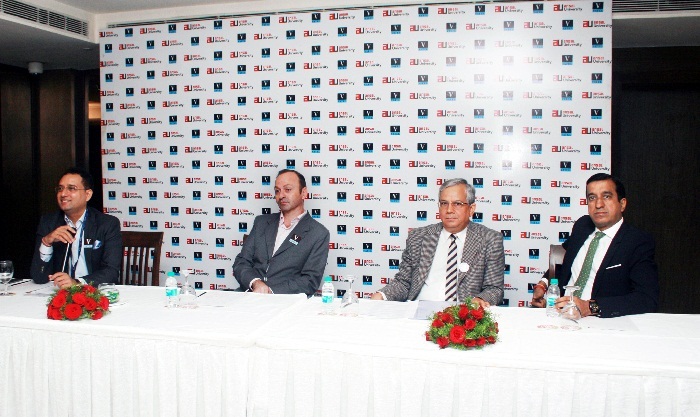 Ansal University, Gurgaon in a press meet on April 7, 2015 held at The Lalit, New Delhi announced its collaborations with Vatel, an international school of hospitality based in France. This initiative is brought in India by Ecole India to provide an international platform and expertise to students in hospitality management domain. The university also announced its admissions process open for the newly collaborated programme,B.Sc (Hotel Managemet and Catering Technology). The guests present in the press meet were Mr. Laurent Guichoux, Academic Director, Vatel India, Prof. Raj S Dhankar, Vice Chancellor, Ansal University, Sarabjit Singh, CEO, Ecole India and Mr. Pranav Ansal, Vice Chairman,Ansal properties and Infrastructure and other Trustee’s of Ansal University. Sarabjit Singh, who had been instrumental in bringing Vatel to India added about Vatel’s USPs – “The French do everything with passion and detail. With Vatel School of Hospitality management in India, we are bringing that passion from France to India. How does Vatel deliver this passion? Through a dedicated French faculty; through their unique “Savoir faire" manual; and through their history of 30 years of hospitality training across schools all over the world. However, their USP is not 7000 students studying at Vatel schools; it's not their 27000 alumni; and it's not their Marco Polo exchange program. It is their ability to create Vatel school across the world that meet the local needs of the students in that part of the world while preparing them for the international world of hospitality." This undergraduate programme will be of three years duration with 100 intake capacity of students in its first batch commencing this year. The course will have expertise international faculty, students exchange programmes and internship programme with campuses across five continents. Your Ansal University, Gurgaon brochure has been successfully mailed to your registered email id .